The term ‘man and van’ has become part of the language over recent years. We’re not sure if there was a sudden increase in the numbers of ‘men’ or an influx of ‘vans’ that fuelled the phenomenon but nowadays you can’t look in any newsagent window without seeing these services on offer. Of course, we happily include in this the idea of a woman with a van too, so please don’t send us any letters! There’s probably no way of determining how many ‘businesses’ are offering a ‘man and van Manchester’ service. There are probably thousands but as the saying goes: ‘let the buyer beware’! On the face of it, it’s relatively easy to become a man (or woman) with a van. All you need, whatever your gender, is a van and an advert offering your man and van Manchester based services. The rest is in the lap of the gods. Let’s face it, you’re trusting someone with your treasured possessions or full house contents and you need to make sure they have important things like insurance, are fully trained, competent and have a good reputation. It’s wise not to rely on trust alone. At PODS we offer a comprehensive service. Not just the man and the van. Our man and van Manchester team offer a cost effective service with something you won’t find elsewhere: added peace of mind. Are you fully insured against loss and damage? Are your team fully trained removals experts? Do you have all the necessary equipment to ensure my goods are safe in transit? Can you supply packing materials in advance so my things are well protected? Can I see some reviews from your previous customers? If the man and van Manchester service starts scratching their chin about any or all of these enquiries then it’s time to call in the professionals. 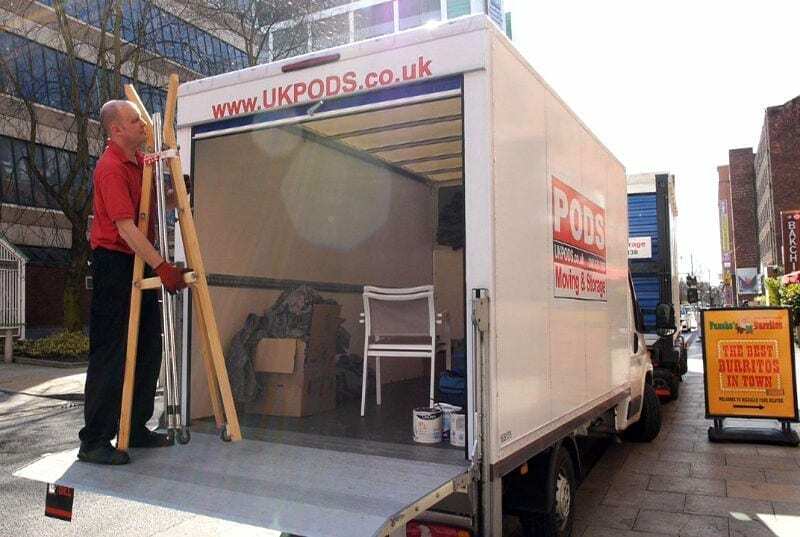 PODS can answer an emphatic yes to ALL these questions and on top of all that we add a layer of excellent customer service and a range of equally outstanding complementary services such as the free use of wardrobe boxes for your hanging garments, mattress protector and furniture covers on moving day to make our man and van Manchester service second to none. That’s why we have hundreds of satisfied clients who have used our men (and women) and vans to quickly and easily solve their ad hoc removals needs. To arrange a man and van quote from PODS, contact us today on 0161 300 9712 or complete the form on the website and our dedicated team will call you back.